Another cryptozoological blogger, Dale Drinnon, has put up a post recently on the Surgeon's Photograph which can be found here. 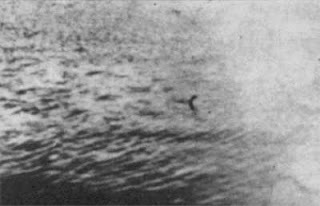 As readers may know, this photograph was exposed as a hoax by Alastair Boyd and David Martin in their expose book some twenty years ago as a model neck attached to a toy submarine. Though most accept this (including myself), others continue to raise questions about the book's theory. Loch Ness researchers such as Henry Bauer and Richard Carter have questioned the theory and Dale is the latest to offer his thoughts and claims that the model would be unstable if fashioned in such a way. Now I admit that I have my own questions against the theory, but accept that the pros for the case significantly outweigh the cons. But let us look first at Dale's claim that the model would simply tilt over. The picture below (not from the Boyd and Martin book) is a suggestion as to how the model may have looked. The first thing to note is that the neck is made from a substance called "plastic wood". It was initially suggested that such a substance did not exist in 1934 but this advert from page 103 of the March 1928 "Popular Science" shows it was around and popular as a DIY substance. Looking at the page, it reminds me of the modern "Polyfilla" as an aid for filling in cracks and holes but I am sure it had properties which also made it useful as a modelling substance. In fact, the advert below states that it was useful on model boats "for moulding figure-heads". Dale describes the head-neck construct as "solid wood" but this is where things get confused. If it was a solid mass then I too would wonder whether the model could remain stable. My own take is that the model was more likely to be hollow in some fashion. In other words, a head-neck was moulded from a handful of this substance which we are told in the above advert "handles like putty" before it "hardens into wood". 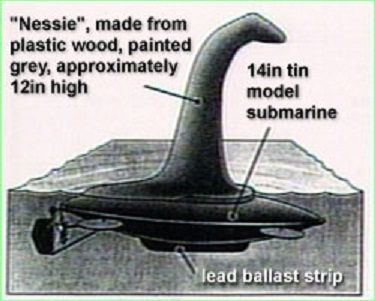 But if the model is hollowed too much then (assuming it is a watertight attachment) buoyancy becomes an issue and the submarine would not be able to drag the head-neck underwater. It seems that some trial and error would be involved in finding the right density and the lead ballast strip mentioned in the picture would have been part of the solution. Was this actually achievable? The problem is no one to my knowledge has tried to reproduce the original construct of plastic wood neck and toy submarine. In fact, modern reconstructions use modern technology in the form of very lightweight Styrofoam to float the object but clearly would not be able to mimic the submerging toy submarine. However, I don't think such a modern model was intended to mimic such a scenario but rather used to reproduce the original "as you see it" photograph. Could a more 1930s reconstruction act as Christian Spurling said? Nobody knows for sure as I am not aware of any such experiment. I doubt plastic wood is available today but a substitute of similar properties should not be difficult to source. Finding a metallic submarine that submerges underwater may be more difficult. Until then, the door of doubt is left slightly open. Others have raised questions such as why Wetherell did not expose the Daily Mail after publication and extract his revenge. The other open question is the mysterious second photograph. The head in that picture is clearly different to the famous first pose. I speculated whether the hoaxer may have remoulded the head into a "diving position" but since our advert says it hardens into wood on setting, that does not seem possible without snapping off the head. It is pointed out that the wave patterns on the surface are very different to the one in the first picture. This is conceded, but it is also conceivable that a sudden gust of wind can rewrite the surface of the water. The argument peters out to the conclusion that it was just another hoax picture. Who knows, but to this day I have seen no satisfactory explanation of how this second picture came to be and the expose book offers no clues. The arguments are more to disassociate from the first photograph and then ignore it. It seems we have a mystery within a mystery. Now I am not suggesting the first picture is a fake but somehow the second is genuine. That would be silly. But there is a "crack" in our knowledge here that need some "plastic wood" to fill it in. It is a given that Alastair Boyd would have asked Spurling about the second photograph. The absence of quotes from Spurling on this subject suggests he knew nothing about it (In Spurling's defence, this suggests he is being truthful about the first picture. After all, if you are going to lie about the first photo, you will keep on lying about the second one.). So what is the story behind this second photograph? Comments are welcome!